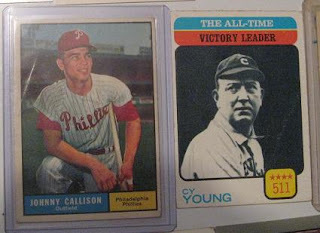 I had intended to do a whole Retail v Hobby comparison of 2011 Topps, but sort of lost my momentum on that one as I (and many others) seemed to be suffering from new release fatigue. Amazingly enough this came out of a Target gravity feeder. 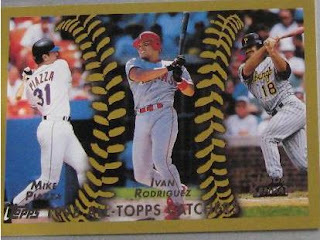 Apparently the Legends Variations are pretty rare, with a 1:80 seed ratio for HTA boxes according to BaseballCardPedia. 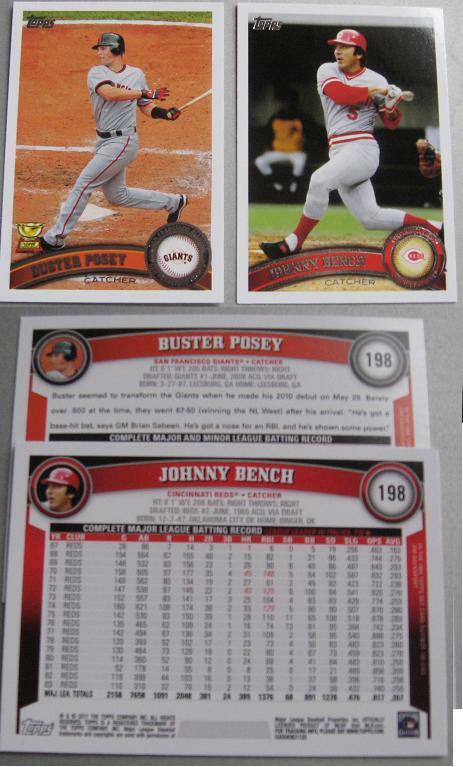 The #198 Bench Variation shares #198 with the San Francisco Giants fine young catcher Buster Posey. C)quit while you were ahead? 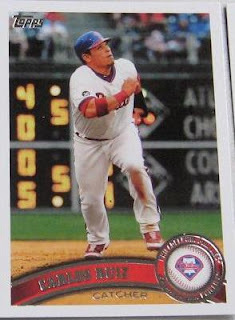 The team cards all have season highlights on the back, unfortunately one of the BoSox Highlights happens to be a Phils low-light when Joe Blanton through a clunker of a game which included giving up a Grand Slam Home Run to Daniel Nava in Nava's first career AB on the first pitch the rookie saw at the major league level. 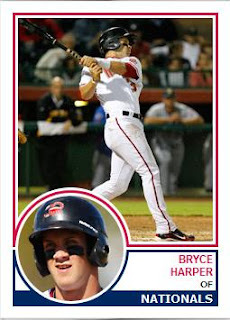 Yet another Catcher themed card - These are CYMTO 2011 to me. who needs them. I also wanted to take the time to note the 2010 Pull of the Year. And we have another great pick featuring one more catcher - but he is a very special catcher. Thanks all for helping me pick out the 2010 Pull of the Year via a series of Poles - And also Junk of the Year. 2010 was the year of the mini for me - so it is very appropriate that the Pull of the Year was a mini and a 2009 Goodwin, which is one of my favorite sets that I discovered in 2010. We are up to the 5th inning of the 2011 Edition of Spot the Sig! already. This years competition has been very entertaining with four different winners for the first 4 autos. To be honest all four sigs must have been way to easy because the answers came in pretty darn quick. This auto may be a bit tougher. The first person to identify the author of the following sig will earn a Triple in the 5th inning of STS! We have come to the mystery ticket round. As you know by now Cliff Lee has returned to the Phillies after a year traveling through the Junior Circuit's western division. 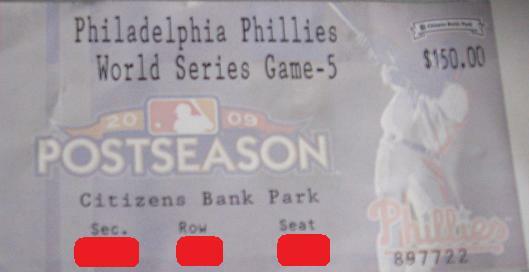 I have painted over the section row and seat number on the ticket. For the bonus your task is to guess the numbers for the Section Row and Seat. The bonus is good for a walk. There will be 3 different bonuses awarded. One each for the Section, Row, and Seat. Whoever is closest to each will be awarded the bonus. Duplicate answers will be allowed. One person can get multiple bonuses. Therefore it is possible for one person to earn Three Bonus Walks this inning. STS! Standings entering the 5th Inning. Waxaholic - Braves: Man on Third. Ron Shelton directed the fine 1994 film "Cobb" which starred Tommy Lee Jones as the crazed and troubled Detroit Tigers legend Ty Cobb. The present day Tigers have another troubled star on their roster in the form of the talented Miguel Cabrera. That is some pretty good company. 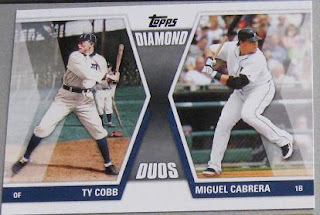 Being associated with those great names does not mean that Miguel Cabrera doesn't have a problem or absolve him from getting behind the wheel of a car while consuming a bottle of whiskey. To me no one has an excuse for driving drunk - especially someone who has made 54 million dollars. Congrats to CalJr3000 of Too Many Grandersons who quickly spotted this weeks auto of Marlins Ace Josh Johnson. Pop Quiz: Who led the NL in ERA last season? It wasn't Roy Halladay, Adam Wainwright, or Ubaldo Jiminez - It was Josh Johnson. Johnson isn't near there yet but if he had enough innings to qualify he would lead all active pitchers in career W-L percentage. Despite the fact that Johnson is a potential Cy Young award winner Johnson's autos are pretty affordable. I picked up the above card for $4.24 last yr via auction. The same card has gone for $5 and $5.26 recently. The 2011 Topps auto (also a sticker) went for $6.25. The rather bland 06 Topps Auto (on card) went for $8.50. Josh Johnson Autos peaked out at $45.00 for an 06 Topps Chrome (BGS Slabbed). Magglio Ordonez comes up with an RBI Single for Too Many Grandersons. TMG takes the first lead in this Edition of Spot the Sig! - and also picked up a bonus and will have the bases Loaded going into this wkends STS! 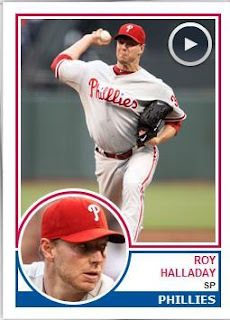 8 of 13 contestants picked up bonuses - The Bulk of the Phils rotation was picked, congrats to observant readers like mmmmRhubarb who did their research and found out that Closers like Jon Rauch were among the pitchers that Team Phungo witness win games. Bonus answer in parens - if there is a "+", the answer was correct, if there is a "x" the answer was inccorect. Thanks all for playing so far. There are a lot of runners on base already - look like we are in for an exciting competition. Philadelphia entertainment site Philebrity just mentioned a new iPad app Pennant which appears like Baseball-Reference for a Phone or iPad. Can somebody that is more tech savvy tell me if this is actually a step above Baseball-Ref? Couldn't I just access Baseball-ref from an smart phone? Of course Pennant has all the pretty graphics that I don't understand. Spoiler Alert/Warning: In the video portion of the site the user accesses the Joe Carter game - ugh.. This above auto is good for a single runners advance two bases. This weeks Bonus is good for a walk. This one is similar to the bonus from the first inning. Team Phungo took in just over a dozen games this year, name a winning pitcher from one of those games. Ground Rules: All guesses must be unique. Any guess that is repeated from an above participant will be ineligible for the bonus. 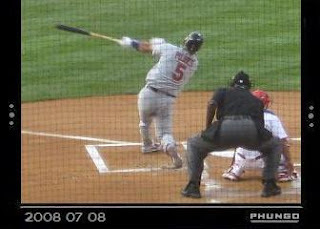 Apparently the Cardinals and Albert Pujols were unable to come to a contract agreement prior to their deadline today. Knowing that both sides are very honest and honorable, I would be shocked SHOCKED! if we heard a peep from either side of these discussions the rest of the summer. In 2011 Team Phungo hard pressed for exposure in the cramped trading card market have come up with a series of Gimmick Cards. What could be better than the popular BFI Series - How about DUAL BFI INSERTS. TWICE THE FUN!! The DUAL BFI is similar to the Black and Blue Card that was produced by Fleer in the 80s. 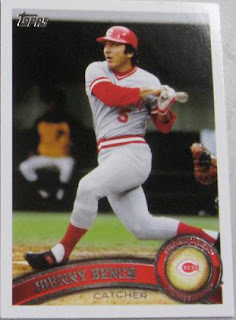 I wanted to take the idea of Fleer and apply it to a card(s) where it makes sense. 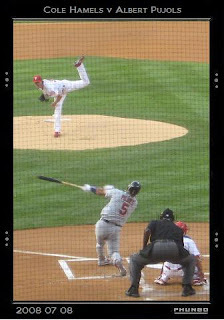 I have placed pitcher v batter photos onto a single 2.5x3.5 card but the pitcher is always further away and dramatically smaller then the batter. This makes it hard to ID the pitcher in the Photo. In the above photo, we are at Pujols' back, which isn't the most desirable situation for a photo. But I think if you double the size of the image and place it on two cards it is a win-win. 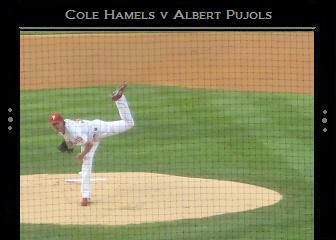 Cole Hamels and his distinct high leg follow through. Here we have two cards that each separately feature a single player, but combined form a single great image. Combining the two cards makes for a single great looking card. 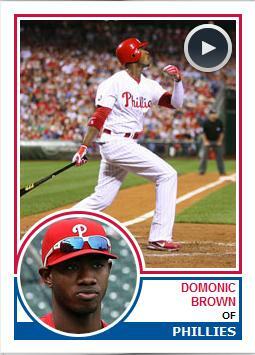 I think this is something that Topps could easily take on and would make for a great looking series of cards. 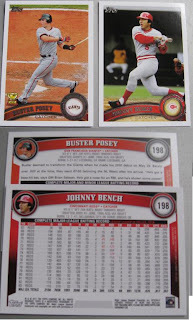 There are 3 Dual BFI pairs that can be found in the 2011 Phungo Set. We will features these throughout the year. I thought this auto was a little touger, but obviously I was incorrect. I believe the "C" in CAIN was the giveaway for Captain Canuck to come flying in and get this one. This is just one of the many great on card autos out of 2009 UD Goodwin Champions set. Every time I see one of the cards posted I marvel at how sharp looking they are. Of course Matt Cain is the #2 or #1A pitcher from the World Champion San Francisco Giants. Cain's Autos remain relatively affordable. Recently on the bay a sticker auto sold for $4.69. A faded 07 Sweet Spot went for $8.00. The 07 UD Masterpieces (On Card) went for $9. The High was $80 for a Graded (9.5/10) 2006 SP Authentic which I believe is the RC of Cain's Autos - it is a sticker auto (#d to 395). A somewhat sloppy looking UD Exquisite 4-Patch Auto (#d/25) went for $65 for the high among ungraded cards. Once again Night Owl picked up the cartoon bonus. 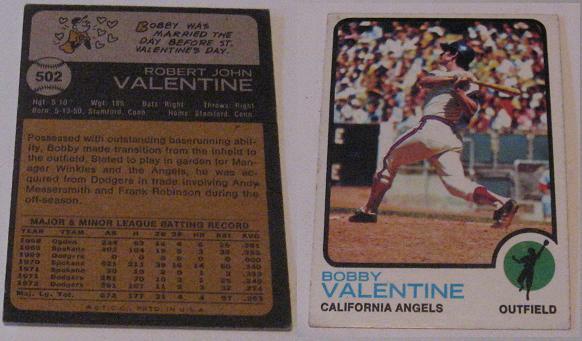 The Card is the calendar appropriate 1973 Topps #502 of Bobby Valentine. According to Wikipedia Valentine is married to Ralph Branca's daughter, but it doesn't specify if this is the woman referred to in the 1973 Topps Cartoon. Valentine, of course, is currently employed by ESPN - you may not have heard he will be in the booth for Sunday Night Baseball, one of the replacements for Jon Miller and Joe Morgan . As mentioned above Captain Canuck (Waxaholic) got the auto this week, good for a Jason Heyward Triple and getting CC on base for this edtion of Spot the Sig. Night Owl earned a second bonus giving him a couple of base runners. After 3 innings we have had 3 different Auto winners and several bonuses awarded making for a tight race so far in Spot the Sig! Waxaholic - Braves: Jason Heyward legs out a TRIPLE! Man on Third. Thanks for the heavy participation in the first couple of innings of Spot the Sig!. I apologize that the first couple of Autographs went so quickly. And now it is time for an old STS! favorite the Cartoon Round. Everybody on your toes as this one should go quickly. Sorry about the Pic - still have PC issues at Phungo HQ. But I think the caption is very appropriate for today. Only one team gets the bonus this week. A Walk goes to the first person to identify the Card number of the above card. Once again we featured an Auto of an Old School Hall of Famer and the Auto was identified easily. 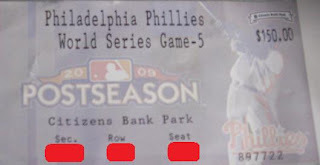 Congrats to Phellow Phils Phan Dawgbones who Spotted this weeks Sig in just four minutes. Don Maynard was part of the 1969 Jets team which was led by Joe Namath and upset the Baltimore Colts in Super Bowl III. Maynard was a prolific AFL Receiver who still holds the career record for Yard per Reception among players with over 600 catches. Maynard played in the AFL, NFL, CFL and WFL - His AFL career spanned the entire 10 years existence of the league. He was elected to the Pro Football Hall of Fame in 1987. Dawgbones picks up a Double and one of the four bonus questions putting men at first and second for his squad. The opening innings have been great, with lots of new players. I promise you that the 3rd inning will be tougher then the these first two. This week we will return to our regular Sunday Night starting time. Once again this year on MLB.com they have come out with their fantasy rankings. To find the cards of your favorite players check this link. Last year MLB and Topps the fantasy preview was done using 1987 Topps. Welcome to the Special Saturday Edition of Spot the Sig! Since we moved STS! to Saturday this gives us the opportunity to let everyone make predictions regarding tomorrow nights game. Here are 4 separate Superbowl Related Bonus Questions which you get to take a shot at this week. Each is worth a Walk - Whomever gets closest gets the bonus for each question. Bonus 3: Winning Team and Winning Teams Time of Possession. We will be accepting unique entries only. If you pick the Steelers to score 79 points and somebody already picked 79 your guess will be ignored. Each bonus is worth a Walk therefore a person could potentially get 4 walks and score a run just on the Bonus questions this week. Entries for the Bonus will be taken till 6p on Sunday. We had a great first week, thanks everyone for participating - It looks like we could be in for very exciting Spot the Sig! The Bull Says "Don't Forget Spot the Sig! is hosting a special Saturday edition this Week - STS! is happening Tonight Saturday Feb 5th at 9:30p Phungo Time (That is Eastern)"
Team Phungo is off to the show today - Concorde Mall Card Show outside of Wilmington DE. Stop out and say Hi. I will be the crazy looking guy navigating a dime box looking for a 1959 Topps Hank Aaron Card. Chinese New Year that is. Thursday marked the Chinese New Year, 2011 is the Year of the Rabbit or Hare - The Chinese Zodiac runs in 12 year cycles rather than a 12 (or 13 month Ophiuchus??) cycle. 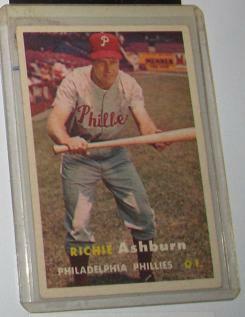 Born in 1927 Richie Ashburn! Sorry, PC still on the blink so your getting Photos rather than scans. Chapman was killed by pitch thrown by Carl Mays in 1920. The incident led to rule changes regarding the use of new baseballs and batting helmets. Red Dooin was the Phillies catcher roughly 100 years ago. Lot of great Year of the Rabbit players - 1987 is off to a pretty good start as well - I am saving that spot for Phillies Prospect Dominic Brown. Other rabbits I didn't have the patience to look for included Joe Gordon (1915) and Jim Bouton (1927). Representing 1855 Paul Hines who won the first triple crown in 1878. Another Triple Crown Winner, Carl Yastrzemski is a Rabbit as well (1939). The first Rabbit would be Nate Berkenstock (1831) who is the earliest born player in the history of baseball. That is a lot of incredible names but perhaps the most significant Baseball related Year of the Rabbit Birth is Hall of Famer Walter James Vincent Maranville or RABBIT MARANVILLE born November 11 1891. Well, obviously the 1st inning of Spot the Sig! was much to easy. The Double went to the Autograph Expert from Autograph Cards Zman40 . NOTE: If you're participating in STS! be sure to read the special announcement at the bottom of this post. The Hillshire Farms auto series is familiar to most collectors. You can get several cheap autos of Hall of Famers and major stars from the series. The cards are not liscensed through MLB or the Hall so they do not contain team nicknames or logos, but the picures are good, the signature is on card, and the design is sharp. Senators/Minnesota Twins Franchise. His 573 career Home Runs is still good enought to rank 11th all time, He led the AL 6 times including his MVP year of 1969. The Killer only got to participate in 1 World Series,in 1965, when the Sandy Koufax led LA Dodgers defeated the Twins in seven games. Recently on ebay the above card went for $11 shipped. Several of his auto cards have sold in the $20-$30 range recently. Some of the ones I like include 1999 SI GOTG ($22), 2005 Sweet Spot ($28.49). The 2005 Donruss Signature Postage Stamp Auto (#4/5) sold for a whopping $125.50. Topps issued Harmon Killebrew's Rookie Card as part of their 1955 set (#124). A soft cornered wrinkly version of this card went for $22.03 on the bay a week ago. Several nicer versions of the card went in the $31-$40 range. The card peaked out at $279.06 (PSA-NM). This card was also reprinted as part of the 2010 Topps CYMTO series. WIlliam at Foul Bunt has been reviewing the 1955 Set and just posted the Killebrew Rookie Card as well as some additional bio-career information. Harmon Killebrew is also one of the Hall of Famers who is part of the somewhat difficult 1959 High Series (#515)- Low recent auction on Ebay was $17.50 for a decent looking card - a few cents cheaper for a yucky one with tape residue. You can do better if you wait around long enough, A few years ago I found a passable one at $7.25 on ebay. As we know Zman40 Picked up the Double he also added a walk for picking up the bonus by guessing Ryan Howard, Here is the complete list from a record setting first day of STS entries. Anybody who has a runner on First guessed a Player that Team Phungo Saw homer in 2010. I think I got everyone - If I missed you or misrepresented your squad, please let me know. And, Thanks to everyone for such a strong showing on opening night of Spot the Sig! Apparently there is some sort of football game on Sunday Night so we will be hosting the 2nd Inning of STS! on Saturday Night.